Enjoy 3 for 2 on Christophe Robin. Tame locks whilst on-the-go with the Travel Hair Brush from Christophe Robin. 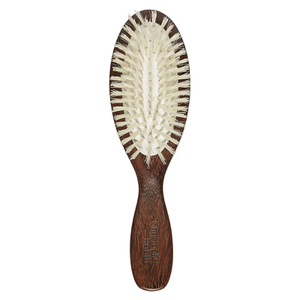 Crafted with natural boar bristles, the smaller size Hair Brush ensures gentle brushing, keeping the hair free from damage. The travel brush utilises a traditional French method, boasting bristles of varying lengths which effortlessly glide through hair, leaving locks detangled and ultra-shiny, wherever you may be. Necessary to stimulate blood circulation, regular brushing can contribute toward healthy hair growth. Brushing tresses from root to tip evenly distributes the natural oils in hair and subsequently protects the fiber against damaging external factors. Any time during the day, flip your head upside down to stimulate the blood circulation, brush from roots to ends to massage, oxygenate and help eliminate product build up from the scalp.